A colour photograph of the Jabez Lynde House being moved down Cochrane Street towards its new permanent location at the southwest corner of Brock and Burns Streets. 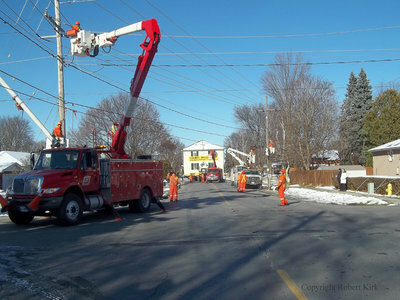 In this view Whitby Hydro trucks are moving the power lines to allow for the house to move through. Relocation of the Jabez Lynde House, November 2013, Robert Kirk. Whitby Archives D2013_011_023.